Share the post "IFNH Building Makes List of New Jersey’s 25 Must-See Buildings"
While architecture is considered an art based on utility and aesthetics, in the ordinary developed landscape, few structures stand out as striking designs. In this light, USA Today Travel asked American Institute of Architects (AIA) chapters across the country to name 25 structures visitors should see in their state. 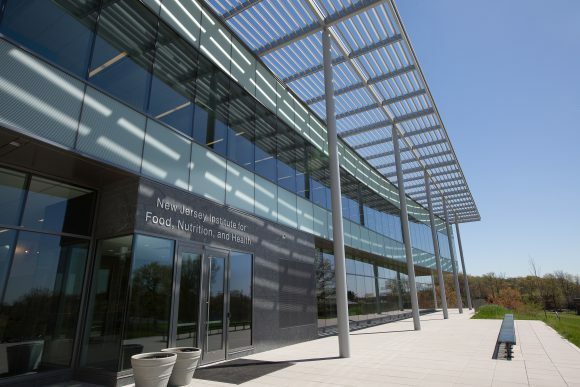 Included on the list of “25 must-see buildings in New Jersey” is the New Jersey Institute of Food, Nutrition, and Health building at the Rutgers School of Environmental and Biological Sciences on the George H. Cook Campus. This designation is duly notable considering the honor is shared with such iconic New Jersey structures as the Statue of Liberty, the George Washington Bridge, Thomas Edison’s House, a Frank Lloyd Wright house and a doo-wop motel in Wildwood. Center for Health and Human Performance at IFNH. Working out are grad students Alan Walker, David Sanders, Anthony Poyssick and Brittany Bozzini. While the top 25 distinguished buildings represent a range of eras, the IFNH building is one of the few contemporary structures featured. To add another feather to Rutgers’ cap, an additional contemporary structure on the list is yet another Rutgers building, the Rutgers Business School building on Livingston Campus in Piscataway. However, the double recognition doesn’t end there—another building designed by Ballinger, the architectural firm that designed the IFNH building, made the list—the historic RCA Victor Building in Camden. Ballinger has received two awards from the New Jersey chapter of AIA for its design of IFNH. The living wall at IFNH. 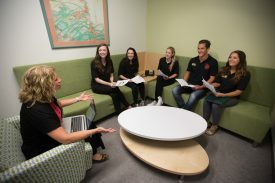 Students, faculty and staff have embraced the IFNH building as the go-to place on the Cook Campus. The bright, open design with multi-functional uses and spaces serves as a popular venue for dining, conferences, meetings and special events. 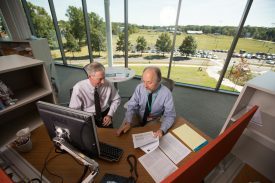 The building serves as Rutgers’ focal point for interdisciplinary collaboration between the university’s research and outreach initiatives in food science, nutrition, public policy, pharmacy, exercise science and sport studies, genetics, agriculture and health sciences research. A top priority of the institute focuses on stemming the epidemic rise in childhood obesity and obesity-related disorders such as diabetes, heart disease, and cancer. Thus the space is filled with facilities and an atmosphere that revolve around health and wellness. 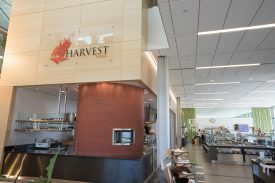 Harvest is the healthy dining venue at IFNH. Features of the building include: health and nutritional research laboratories; conference, board and classrooms; the Center for Health and Human Performance; the Culture of Health Academy–a children’s education and research center–part of New Jersey Healthy Kids Initiative; an open-concept office suite, a student health and wellness center; and the spots that draw the most devotees: Harvest healthy dining venue and a three-stories high living wall, growing 72 different species of plants. 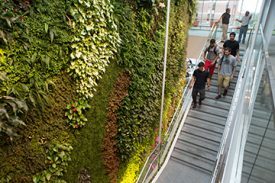 Aside from Passion Puddle during the school’s convocation, the living wall may be the most photographed spot on campus. See the entire list of New Jersey’s 25 must-see buildings. Rutgers Healthy Dining Team meet at IFNH with their director, Peggy Policastro. 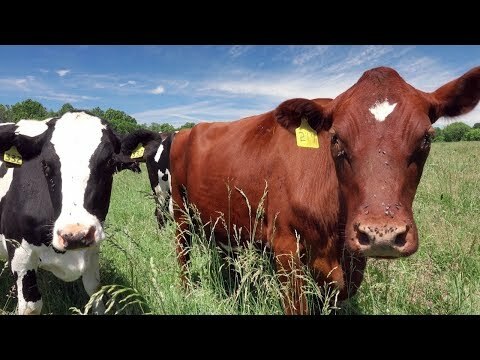 IFNH director Peter Gillies with professor of nutritional sciences John Worobey. 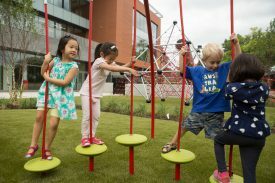 As part of the Center for Childhood Nutrition Education and Research at IFNH, children engage in free play on the playground.